3-15 after the break was enough for the Cats to reach the quarter-finals. Richie Power and Noel Connors battle for possession. A SECOND-HALF scoring surge that included two Mark Kelly goals eased holders Kilkenny into the quarter-finals of the Allianz Hurling League. The Cats led by just two points in front of 8,883 at Nowlan Park but came good with 3-15 after the break to ease comfortably through to the knock-out stages. Brian Cody’s side took their time to get going and registered six early wides, including three from eventual top scorer Henry Shefflin, before registering their first score. But they were much improved in the second-half and built on a 1-7 to 0-8 half-time lead to win by a big margin. Last year’s minor star Austin Gleeson scored an impressive point from a sideline early in the second-half for Waterford. And sub Ray Barry delivered four points after his introduction. But they were only bright spots for Derek McGrath’s Deise who leaked three second-half goals in a 15-minute period. Larkin got Kilkenny’s first after good work by Richie Power. Sub Power also played in Kelly for his second goal in the 54th minute which left them 4-16 to 0-12 up. Kilkenny gave fringe players their chance again with starts for Joey Holden, Brian Kennedy, Padraig Walsh, Farrell and Kelly. But they will be happy that experienced stars like Shefflin, Richie Hogan, Power and Larkin were all impressive and delivered when it counted. Kilkenny scorers: Henry Shefflin 0-7 (0-5f), Mark Kelly 2-0, Eoin Larkin 1-2, Colin Fennelly 0-4, Jonjo Farrell 1-0, Walter Walsh and Richie Hogan 0-3, Richie Power 0-2, Brian Kennedy 0-1. Waterford scorers: Pauric Mahony 0-5 (0-5f), Ray Barry 0-4, Brian O’Sullivan 0-2, Jamie Barron, Shane O’Sullivan and Austin Gleeson (s/l) 0-1 each. KILKENNY: Eoin Murphy; Paul Murphy, JJ Delaney, Joey Holden; Brian Kennedy, Jackie Tyrrell, Cillian Buckley; Padraig Walsh, Richie Hogan; Walter Walsh, Colin Fennelly, Henry Shefflin; Jonjo Farrell, Mark Kelly, Eoin Larkin. Subs: Richie Power for Farrell (27), Kieran Joyce for Kennedy (52), Lester Ryan for P Walsh (56), TJ Reid for Hogan (58). WATERFORD: Stephen O’Keeffe; Tadgh de Burca, Shane Fives, Noel Connors; Jamie Nagle, Michael Walsh, Philip Mahony; Kevin Moran, Shane O’Sullivan; Jamie Barron, Pauric Mahony, Stephen Molumphy; Maurice Shanahan, Brian O’Sullivan, Austin Gleeson. Subs: Barry Coughlan for Nagle (32), Ray Barry for Shanahan (33), Seamus Prendergast for Gleeson (49), Ryan Donnelly for Barron (60). Email “Stunning second-half sees Kilkenny ease past Waterford”. 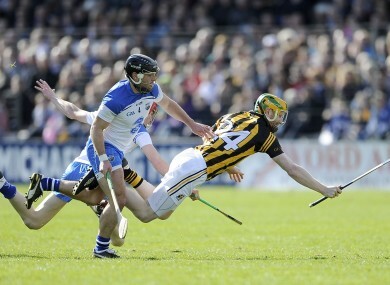 Feedback on “Stunning second-half sees Kilkenny ease past Waterford”.